State House candidate Ronnie Mabra recently had a residency challenge filed against him, claiming that he does not live in the district he seeks to represent as a member of the Georgia General Assembly. Part of the Ronnie Mabra residency challenge is centered around a midtown condo bearing the address 361 17th Street, Unit 1306, Atlanta, Georgia, 30363. Research and public records (pictured left) show Mabra did indeed own 361 17th Street, Unit 1306, Atlanta, Georgia, 30363. 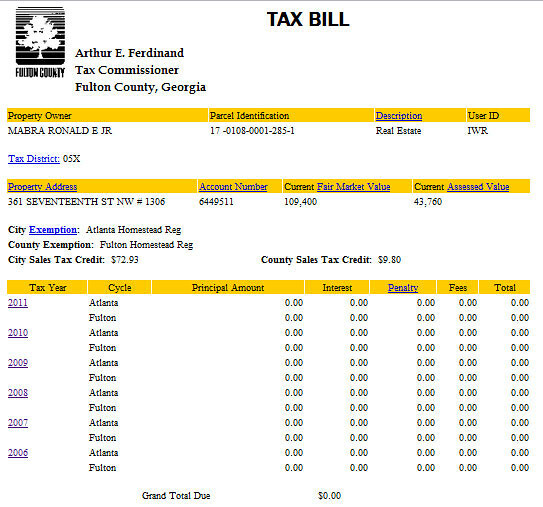 In fact, Mabra claimed homestead exemption on his midtown condo every year between 2006 and 2011. However, in 2011, tax records indicate Ronnie Mabra lost his residence to foreclosure. After the foreclosure, Mabra's address changed to 155 Thorton Court, Fayetteville, Georgia, 30214. This property, according to the Fayette County Tax Assessor's office, is owned by Mabra's mother. Voter registration records on file with the Secretary of State's office show that Ronnie Mabra registered to vote at 155 Thorton Court, Fayetteville, Georgia, 30214, on October 29, 2011. Now that a challenge to the qualifications of Ronnie Mabra has been filed, it is up to the Secretary of State and an Administrative Law Judge to determine whether Mabra meets the minimum requirements to run for office. Still, Ronnie Mabra's political opponents must be salivating at the opportunity to portray him as an outsider who has barely lived in the 63rd district for a year. Before then, Ronnie Mabra was living in midtown. Public records are proof of that.